This one-year course is designed to cover all aspects of Class A tractor and trailer commercial vehicle safety, maintenance and operation. 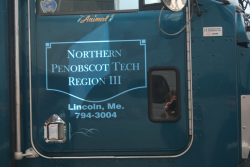 The course will include air brake training and state of Maine requirements are adhered to throughout the course. Relevant Federal Motor Carrier Regulations (FMCSR) and Maine Motor Vehicle Statutes (title 29-A) are covered. Additional instruction is provided in the areas of Hazardous Materials and Cargo Handling, Double and Triple Combinations, Tankers and Trip Planning.The course consists of classroom, labwork, behind the wheel, Range and road driving. Successful completion will enable each student to obtain an entry level position in operating a commercial motor vehicle in Maine. Federal regulations require each student to submit to drug testing prior to training with vehicles. Inspect Vehicles for complying with the federal ans state statutes. Understand the Control Systems of different tractor trailer trucks and Class B Trucks. Understand the Basic Vehicle systems and how they work to make vehicle inspections more easily understood. Understand the Basic Control of Class A CDL Vehicle Backing Driving ahead, right and left turns, starting and stopping. Fundamentals of Visual Search Methods, such as used in driving skills. Practice Speed and Space Managment while driving on the road, both in cities and on the road. Effectively execute Emergency Maneuvers needed to assist driving skills in severe weather, or difficult traffic conditions. Practice proper Accident Procedures, how to facilitate the authorities and to attend to injured, and how to deal with minor infractions. Properly document Hours of service and Log book. B. Successfully complete the State of Maine CDL Testing. Students will be graded on Understanding, Skill, Attitude, and Participation. Attendance is critical. Tardiness and/or lost time will result in failure to complete the program for a student. 1.Written examination of an 80% or better score. C. Commercial motor vehicle safety systems. C. Speed control for weather, traffic, and cargo control. D. Ability to choose a safe gap and correctly position the vehicle when changing lanes and turning.